Few artists travel the continuum between sublime passionate vocals and skilled musicianship. Divine soul man, FRANK MCCOMB, is one of the very few. His virtuoso piano and organ work has made him an underground favourite on the soul and jazz scenes and a highly sought after session player. 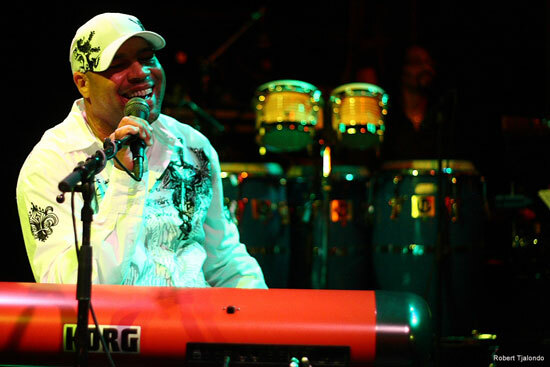 He’s recorded and performed with many of music’s giants including: Frankie Beverly & Maze, Teena Marie, Chaka Khan, Lalah Hathaway, Terri Lynn Carrington, Phyllis Hyman and Teddy Pendergrass, and even Prince. career as a music director for the late Gerald Levert and pop diva, Anastacia. The televised performance served as an introduction to some and as re-connection with fans. Frank McComb’s journey to the world stage began in 1970 in Cleveland, OH. The musical prodigy started playing piano at the age of 13, under the tutelage of his aunt. He recalls, “It all started in February of 1983. Church had just ended and my aunt was still playing on the church piano. She made it look so easy, so I asked her to teach me to play. I wasn’t expecting to start that day, but she scheduled my lessons for 1 hour every Sunday after church. Mysteriously the classes ended after the 3rd week, I was left on my own to tickle around on the piano after church services.” If you do the math that amounts to about 3 hours of piano training, however the seed was planted so deep inside young Frank that he continued to grow as a musician. Two years later, he met Willie Ross, a local R&B guitarist who was so impressed by the youngster’s playing he enlisted him for his local gigging group. “Willie was my musical father,” McComb says. By the summer of 1985, he was the youngest musician playing in clubs around Cleveland, Ohio. Embraced by local veteran musicians who recognized the innate talent in their young prodigy, the older band members supplied his transportation to gigs until he’d saved up enough money to buy his first car. first touring gig. While touring, he met up with D.J. Jazzy Jeff & Fresh Prince and not long after moved to Philadelphia to do session work in the studio which would later become Jazzy Jeff’s A Touch Of Jazz Studios. LeFonque, Frank would reconnect again with Branford Marsalis when the jazz virtuoso took helm as head of A&R at Columbia Jazz signing McComb on as a solo artist. In the summer of 1999, he recorded, Love Stories, but the label had difficulty marketing Frank’s debut because it didn’t fit neatly into the jazz category, floating into blues, soul, R&B, and gospel genres. Eventually when Marsalis left the label, Frank ventured on his own as well. In between labels, he amassed quite a following from touring and remaining an active fixture on the live music scene. the Colored Section”) and released an exclusive European and Japanese import, The Truth which featured music legends Billy Preston and Paulinho DaCosta alongside Bay area favourite Ledisi. While Love Stories and The Truth were in stores, Frank began to hear from fans that the MoJazz Recordings (Motown’s Jazz imprint) had been leaked and his unreleased music was selling on the black market for as much as $50 per cd.” He adds, “I was often asked to sign bootleg copies of my own music. I decided that if the people wanted the music so much that it was selling for $50 on the black market, unmixed, unmastered, without artwork, that I should form my own music company and take the chance on recording, packaging, and selling my own music directly to the buying public. What did I have to lose?” he reflects. He formed Boobeescoot Music, built a home recording studio and launched a website, www.frankmccomb.info to promote his music. “Over a period of 4 years I had recorded a large number of songs at home with no special purpose for them. I placed them in what I call my “vault” and left them there,” he shares. One night in his studio while thinking about how much music he’d created, McComb opened his vault and pulled out tracks that would eventually be compiled into Straight From The Vault, a blend of soul, jazz and pop music, his 3rd album and first album released independently on Boobeescoot Music. The Masters, he also counts Oscar Peterson as his musical hero. After one listen you can also throw Stevie Wonder and Donny Hathaway into the potpourri of influences heard through Frank’s various bodies of work. Velvet Music entertainment is Frank McCombs booking agent for concerts, Private engagements for mainland Spain and the Balearic Islands.